Used by many wardrobe door manufacturers. Solid-nylon guide and pivot. 3/8"OD x 1"H base and 3/8"OD x 5/8"H guide tip. Prime-Line Top and Bottom Pivot Set, Suitable For Use With: Bi-Fold Doors, 3/8 in Base Diameter, 1 in Base Height, Steel/Plastic, White, Includes: Pivot and Guide Fits doors of many wardrobe manufacturers. 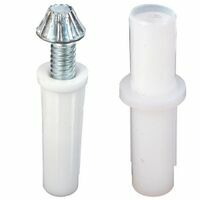 Adjustable steel pivot with 1-3/8"H nylon base and 15/32"OD grooved tip sized for use with specified jamb brackets. Fits on Acme doors. Adjustable stamped steel bracket and self-lubricating nylon bushing. 2-15/16"L x 15/16"D x 1-3/16"H overall. For 1" to 1-3/8" thick folding doors up to 50 lbs. each. Includes 2 No.8 x 3/4" Phillips pan head screws and 1 No.8 x 1-1/4" Phillips flat head screw. For steel frame bi-folding doors. 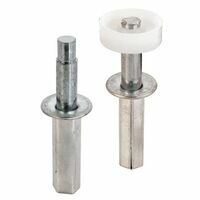 1/4"OD spring-loaded steel rod with 3/8"OD x 5/16"H white nylon guide cap, 5-5/8"H overall. Fits Kenna Frame doors and others. 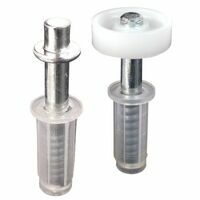 1/4"W nylon wheel with 3/8"OD x 1"H nylon base self-adjusts up to 9/16"H from base. 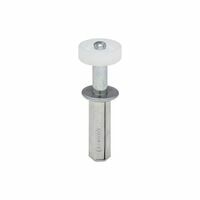 National Hardware Folding Door Top Roller, Series: V391GR, Suitable For Use With: Door Frames, Steel, Plastic, Zinc Plated, BHMA A138.18 Fits Alliance doors and others. 5/16"H square nylon guide tip with 3/32"W slot (7/16" inside slot), 1/4"OD pin, and 3/8"OD x 1"H nylon base. Self-adjusts to a minimum 1-7/16"H overall. Used by many wardrobe door manufacturers. 1-7/16"H cut out allows for non-mortise installation. 1"W x 3"H overall. Includes 4 flat head installation screws.